The Pascal ET is the most advanced portable multifunction calibrator for the measurement and simulation of the following parameters: relative and absolute pressure, electrical signals (mA, mV, V, Ω), temperature (TC, RTD), frequency and pulse. In addition, there is the possibility to include an optional HART® module which allows communication with HART® instruments. 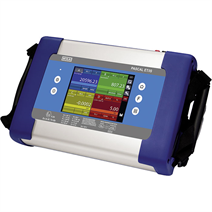 The calibrator Pascal ET has a new large colour touchscreen display with a new intuitive and user-friendly interface, that allows an easy and fast configuration of the calibrator. The availability of ATEX approval II 2G Ex ib IIC T4 Gb - Tamb: -10 ... +50 °C (14 ... 122 °F) expands the possible applications of this calibrator into hazardous areas (only for Pascal ET/IS). Even in the ATEX version the DC 24 V voltage supply for external transmitters is available. The calibrator has four measurement channels and is thus capable to carry out up to four simultaneous measures. For more flexibility on on-field calibrations, the Pascal ET has an on-board memory for data storage that allows the evaluation of logged measuring values and calibration reports. In laboratory applications the real-time communication allows the remote control of the Pascal ET from a PC.